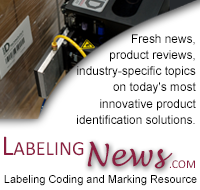 Labeling Systems introduces the Model 1400 Corner Wrap Labeling System designed to print and apply labels to the corner of a case. The system can be configured to apply to the leading/side panels or trailing/side panels of a case. While the Model 1400 is suitable for most corner wrap applications, the system can also be designed to fulfill e-pedigree or track-and-trace initiatives for the pharmaceutical industry. Interfacing with a third party data management system, the system uniquely marks and identifies each product and case as a unique and individual unit for the ability to track-and-trace throughout the distribution chain. Individual product units are encoded through the use of an RFID tag with a unique identifier or serial number through an upstream process. Units are typically gathered into bundles and packed into a case. Cases are then introduced to the LSI Model 1400 Case Labeling System. Data is transferred to the LSI Print & Apply Labeling Head where the labeler prints the label and encodes a second embedded RFID tag. The label is applied to the case and the case continues downstream where an RFID reader reads the encoded tags both on the individual units and the case. The system aggregates the case label information with the individual products and stores the information on a third party server for archival record keeping. The system also features a touchscreen HMI with an Allen/Bradley PLC for broad system control. LSI, a division of Pro Mach, is a provider of labeling solutions for Track-and-Trace initiatives working with the industry leaders in machine vision, RFID and data management technologies with installations in many major pharmaceutical facilities.